There is something essentially comforting about Colin Willcox’s beautiful poems. They occupy a transcendental place of safety that is hard to leave. 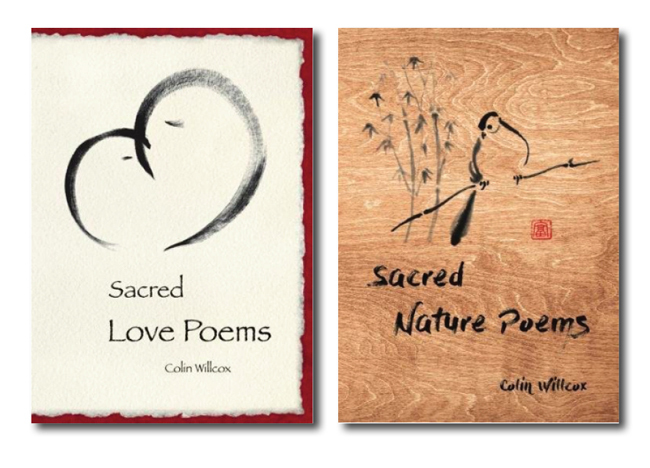 Both volumes of his poems – Sacred Nature Poems is the most recent – contain 70 sublime works that feel blown onto the page, light as gossamer. Each sublime poem leads into the next so to some degree the collections can be seen as large single works. Based in Lewes, Willcox’s style is simple and apparently effortless, as if the poems have been scooped up from a river and held out for our delight. They shimmer with colour, life and emotion. They should be savoured but it’s so tempting to keep reading and spend some more time with the writer. It’s also easy to make comparisons with the great Zen poets but some of Willcox’s love poems are closer in temperament to the Chilean poet Pablo Neruda. There may be elegance and understatement but there is also passion and longing. The poem …yet at night, conjures up Emily Dickinson. Both these volumes are beautifully and thoughtfully produced. If you buy one, you’ll want the other, just buy both. You’ll find them on Amazon. Published by Quiet Bell Press; amazon.com £9.95.